There are different M42 to PK adapters available. Be sure to buy one that sits flush in the body of the Pentax Body, otherwise you will lose infinity focus, which is unacceptable for me but might be ok for portraits. However, all of these adapters will not make your M42 auto diaphragm / auto aperture lens a manual preset lens. 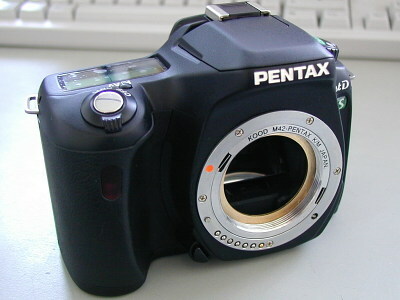 This means that you have no way of stopping the lens down, as the Pentax PK bodies cannot push the "stop down pin" in. But the solution requires a bit of DIY skills, super glue and brass - and a flushly mountable adapter like the original Pentax one. Manufacturing such an adapter would be not so cheap as the current one: The adapter is just a piece of metal, machined on a lathe for inner and outer contours, bored with an M42 machine screw tap and then the bajonet tongues are machined. It would be much more complicated to manufacture it with the the thread covered by a disc. You could not use a machine screw tap, you would need a turning tool or manufacture the adapter in two parts and join them. My rough guess: twice the cost in mass production. My prediction: We'll never see such a thing. So, get your desk clean, here comes DiY to the rescue! My adapter modification will NOT work with the SMC Takumars due to their special aperture transmission pin! If you need such an adapter, scroll down for info and a link. This is the pin that must be pushed in on Auto lenses. This lens however is a specimen with an A(uto)<->M(anual) switch. It is the worst lens I own (or so I thought), so I used it for these tests. The unpainted ring, turned from brass and the painted one, glued onto the adapter. Flat black paint against reflections. My first version used aluminium, but it was a bit soft and got scratched by the aperture pin too much. I glued the machined disc onto the adapter with super glue. Be careful with superglue! Also, some types of superglue produce fumes that can fog (=destroy) glass, plastic and coatings. If unsure, use the glue far away from your optical instruments and follow the directions that come with your glue. I had mine turned with 35mm. But this turned out to be too narrow for my Jupiter-9 and barely enough for my Porst 35/1.8. 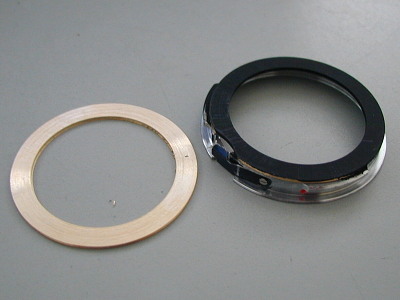 Going wider than 36mm is dangerous, as you might not make proper contact with the aperture pin on some slower lenses. I am sorry, but you will have to check each lens at all focus distances! But only for the first use of each lens, of course. Turn the lens around, focus so that the rear element exits as much as possible. Then screw on the adapter with the glued on disc. GENTLY! Very gently! If you hit a resistance, stop immediately! Try to see if the adapter and the rear element collided in any way. Now focus so that the rear element enters the lens. 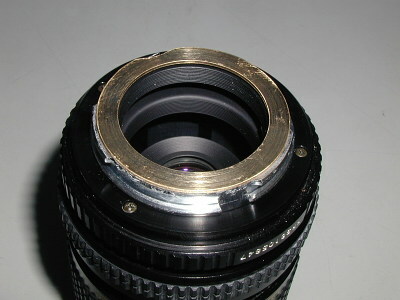 Try to further screw the adapter onto the lens. If you feel no resistance (no gripping the end of the thread), it had formerly hit the rear element. As you can see, the adapter still fits the body and, yes, it also can be detached easily. BE WARNED! If you mess this up, you can end up with conductive metal particles in your camera, you might have a stuck adapter, scratch your lenses and fog your glass. You have been warned! 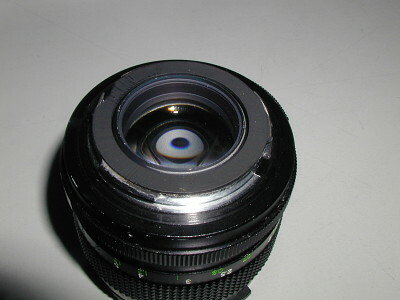 When you use superbright lenses (Porst WW 35mm 1.8, Jupiter-9 85mm 2.0,...), the rear element of the lens has such a large diameter that it almost touches the aperture pin. Thus, the glued metal sheet must be cut/ground/sanded precisely! I was told (by krg) a link to a Japanese Pentax fan who converted his adapter to be used on normal M42 Auto lenses as well as SMC Auto lenses with its special "locking block" and the aperture translation mechanism. I only have one SMC Takumar and this lens can be set to "manual" directly on the lens, so my adapter makes more sense for me. But by all means check out his site in Japanese: http://www.pentax-fan.jp/LENS/M42/M42AD.html OR translated by Babelfish.